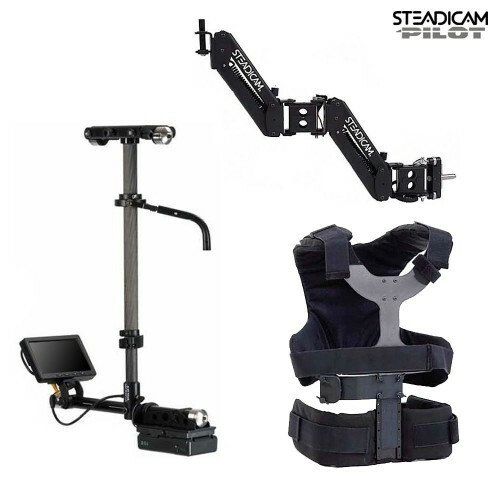 The Steadicam Pilot-VLB is a state of the art, lightweight stabilizer system designed especially for the modern breed of lightweight cameras from 2 to 10 pounds. It features a 5.8″ monitor, Iso-elastic Arm and ultra low profile vest, lightweight sled with CarbonLite expandable post. This system comes with IDX batteries and charger. The VL option allows the monitor to be powered by V-Lock batteries by including a V-Lock battery mount. The Iso-Elastic arm is a two-section, articulated, design that can be adjusted while supporting the camera. With this patented, unique design, the Steadicam operator can smoothly and effortlessly raise or lower the arm throughout its 28 inch boom range. A low profile vest allows the Iso-Elastic Arm to work in a very smooth fashion. Utilizing a proven Low Mass Gimbal the operator has the ability to capture the fluid movement that only Steadicam can provide. A 5.8″ 16:9 LCD monitor is offered for great images and an upgrade to a modern aspect ratio. This system is shipped with two E-7S batteries and a special version of the VL Dual 60 Watt charger. The IDX E-7S battery is based on the V-Lock mounting system and will provide power for the on board monitor and any optional accessories.